Stripes, Sneakers and Sporty Americana - Part Two. 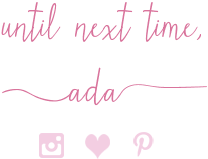 For some reasons I am always running late blogging and blog-posting on Tuesdays, despite it being my day off from work. There is just so much to do at home and a little girl to play and have fun with. Anyhow, Happy Tuesday and welcome to another Stripes, Sneakers and Sporty Americana Look. Stripes are my favorite, always, especially in a T-Shirt or a Dress. I probably have 8-10 Striped Dresses, most Summery but a few Wintery ones too. 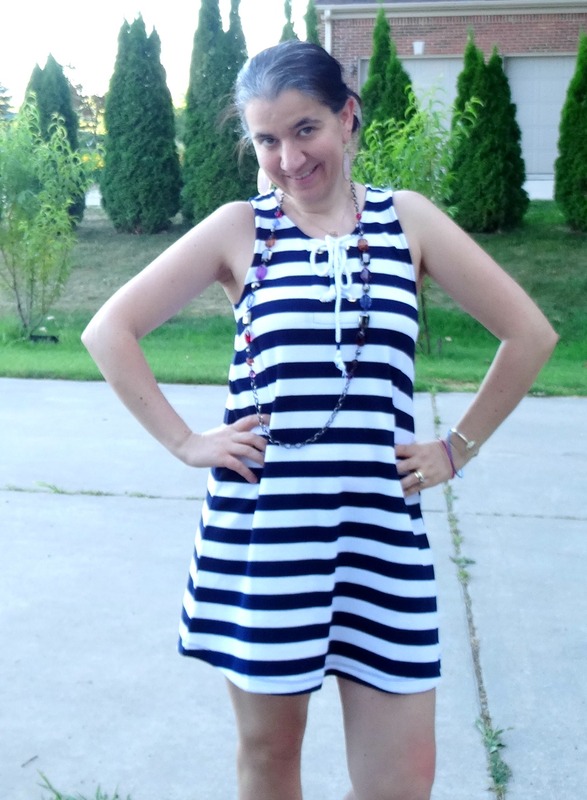 This is the newest one I purchased and it can totally fall in the category of a Little White Dress too since the striking wide white stripes are alternated with navy stripes - Navy+White Stripes say Nautical like nothing else does. 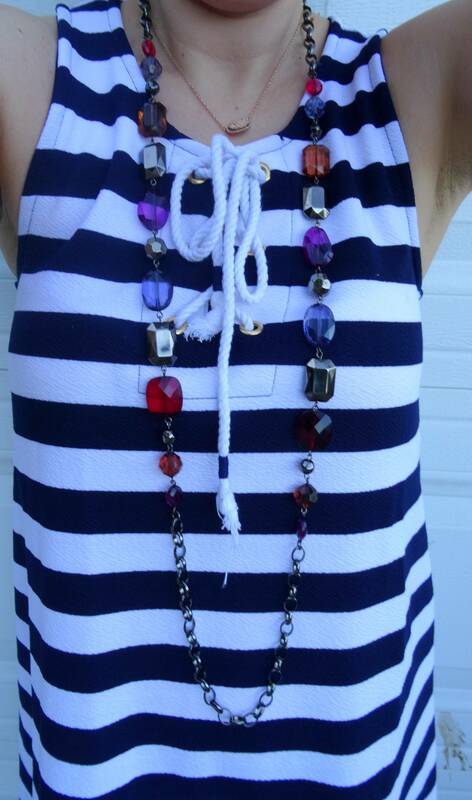 What makes this Swing Mini Dress even more Nautical is the Rope Laced-Up Neckline in the front. I have had the Beaded Necklace and those Red Canvas Slip-on Sneakers in my closet for years. I paired them with this Dress and added all my new Kendra Scott pieces, too. 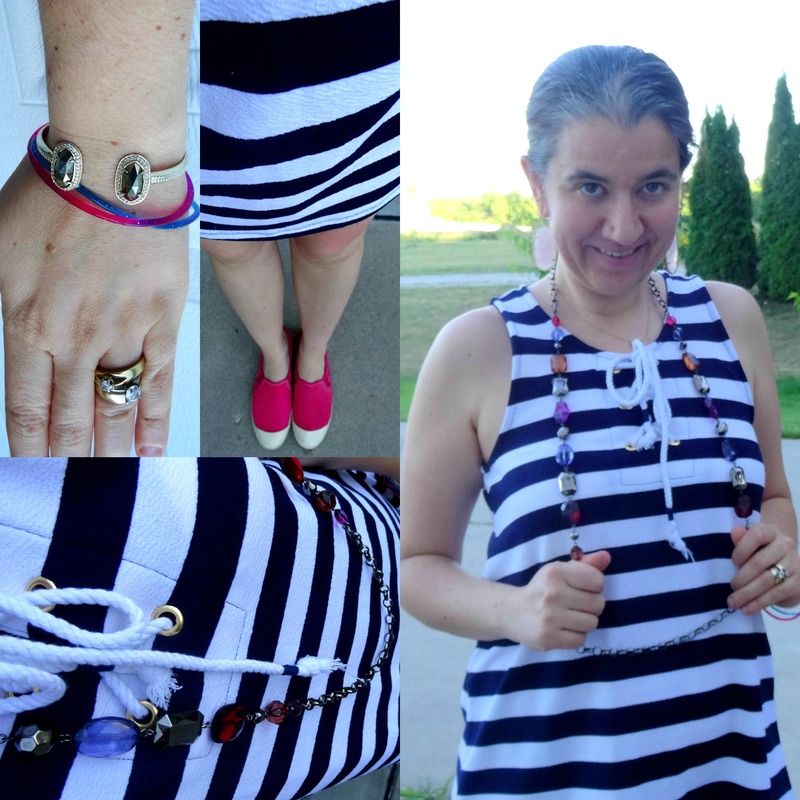 Easy, chic, nautical, sporty yet put together, right? 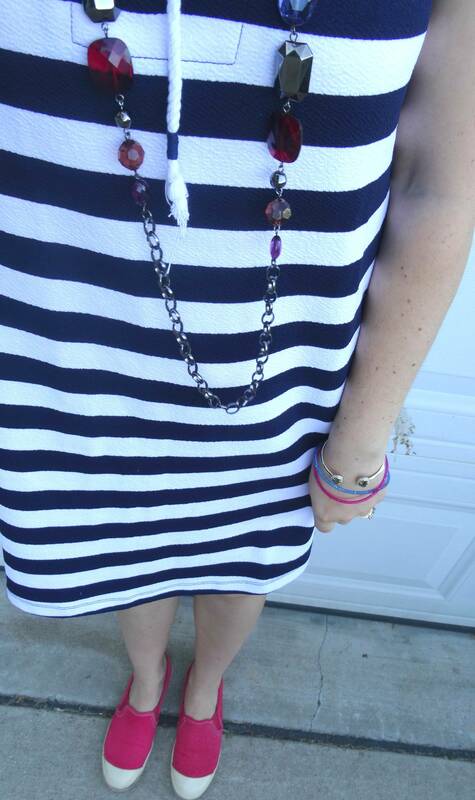 Do you own a Nautical, Casual Striped Dress? Show me how you wear it for Summer. 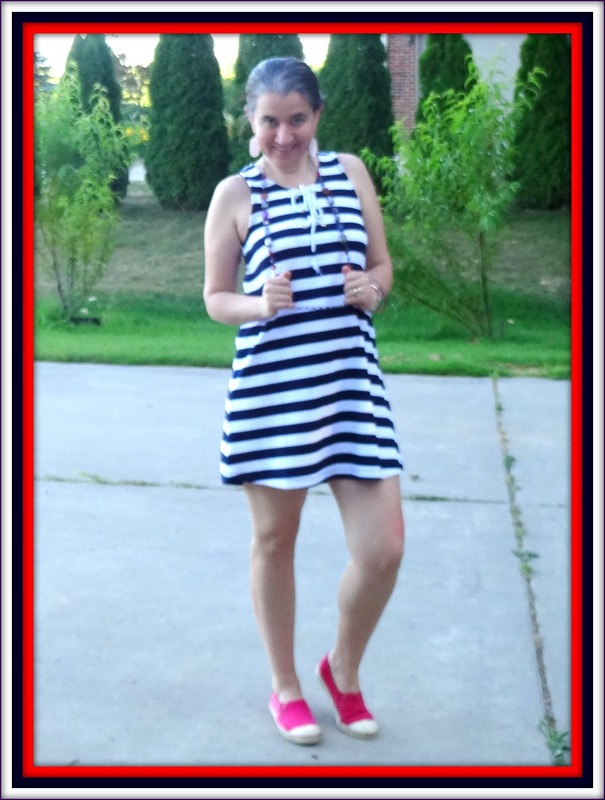 =) You can see yesterday's Striped Dress, Sporty Americana look also. 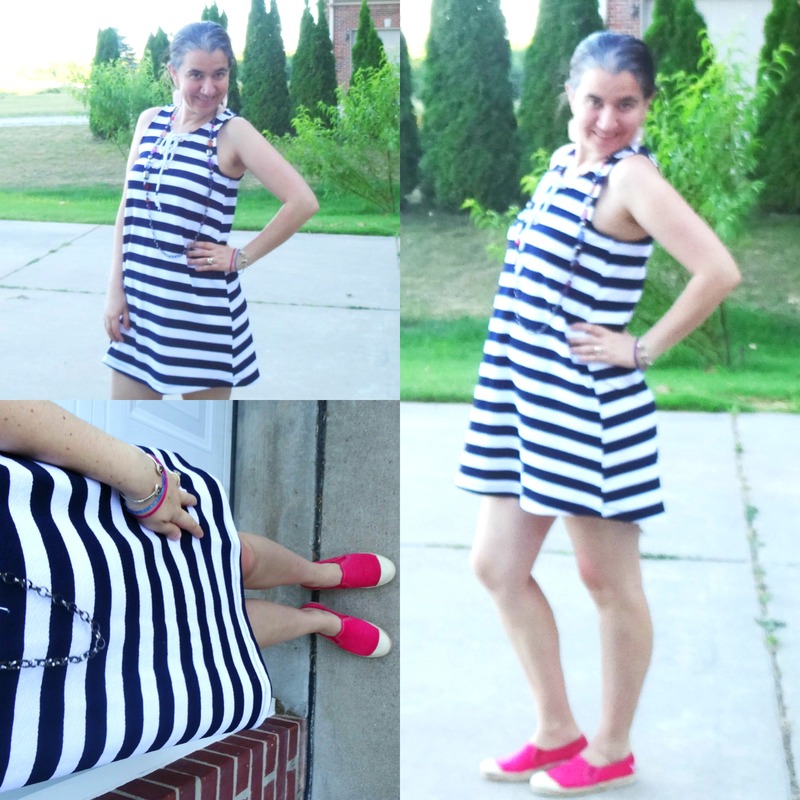 White+Navy Striped Swing Dress w/ Lace-up Front detail: Almost Famous (New) (similar w/ lace-up back, Steal, love this), (cute T-shirt style, on Sale), (similar, Fantastic Deal, love this), (similar, Great Deal), (similar midi option, my Favorite, Splurge). 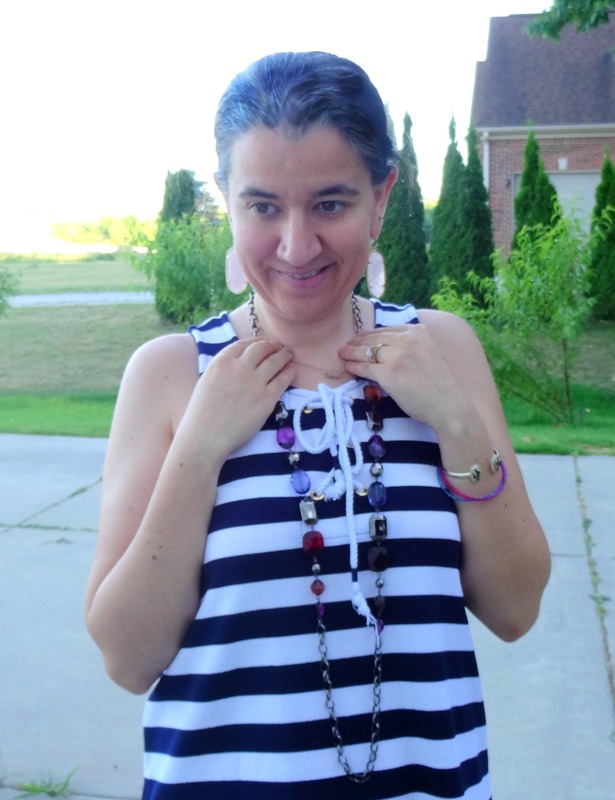 Long Black Metallic Necklace w/ Multi-Colored, Multi-Shaped, Multi-Faceted Stones: Ann Taylor (similar, Steal, love this), (similar, Great Deal, my Favorite), (similar, Splurge). Red Heather Canvas Slip-On Sneakers w/ White Cap Toes: American Eagle (similar, Steal, love these), (very similar option by Converse, Great Deal), (similar), (similar in leather, Splurge, my Favorite). 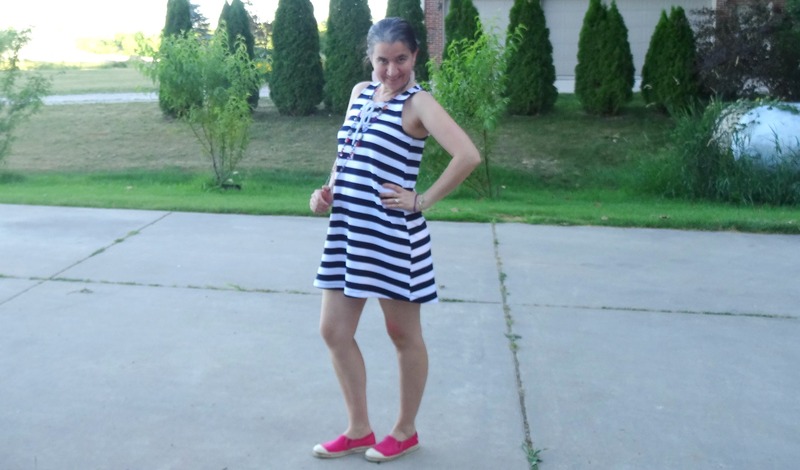 Check out all the adorable options of White+Navy Striped Dresses (linked above). Katherine, Leeanne, Lindsey, Liz, Madeline, Monica, Rebecca, Sarah with Mackenzie, Tania, Vicki and Victoria.